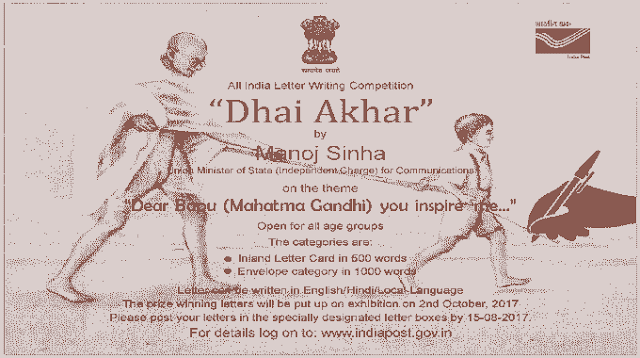 India Post All India Letter Writing Competition, National Letter Writing Competition 2017,Dhai Akhar,Letter Writing Campaign Dear Bapu (Mahatma Gandhi), you inspire me. Government of India, Ministry of Communications Department of Posts (Philately Division). Holding of National Letter Writing Competition under the 'Dhai Akhar /Letter Writing Campaign'. Hon'ble MOS (I/C) C will be launching the letter writing campaign as one of the activities under promotion of Philately for the year 2017-18 on 24th June, 2017 during the closing session of the Heads of Circles Conference. i) The theme of the letter writing campaign will be "Dear Bapu (Mahatma Gandhi), you inspire me" and the letter to be written in English/Hindi/Local language to Bapu, or Mahatma Gandhi may be addressed to Chief Postmaster General of the respective Circles. ii) The letter can be written on plain A-4 size paper and will not be more than 1000 words or in an Inland Letter Cad (ILC) where it will not be more than 500 words. iii) The embossed envelope and the Inland Letter Card (ILC) will be the permitted stationery. iv) This is open to all and includes all age groups. v) The letter, in case of rural area may be brought to the local BO, and posted. The BOs will dispatch it to their respective Account Office (HO/SO) duly entered in Account Bang for further dispatch to concerned Circle office. vi) In district headquarters and larger towns/cities, a special letter box will be erected or existing Letter Box will be clearly earmarked in each of the Head Post Offices or MDGs clearly marking letter box for "letter writing campaign" and in the other smaller towns, in the main delivery post office. vii) The writer of the letter will have to go to the post office and post the letter in that special letter box. The letters should be collected and dispatched to the CPMG of the Circle by the SOs/HOs. Best 03 (three) in a Circle in each category will be shortlisted and will be sent to the Directorate. Out of these, best 03 letters will be chosen in each of the categories and these letters will be sent to Sabarmati Ashram by special messenger. Writers of these letters will be awarded in a function in Sabarmati Ashram on 2nd of October 2017, where a letter exhibition will be held showcasing letters from exhibitors, letters written by eminent personalities and of archival/historical significance, letters from small children, important letters from Government offices to people and vice versa, letters exchanged between eminent personalities etc. In this connection, each Circle will put on display best 10 letters in each category in a special philately exhibition that shall be organized during Gandhi Jayanti in Circle Headquarter. During the exhibition, these entries will be rewarded at the Circle level. Content of the best letters will be given wide publicity and the writers will be given due recognition and rewards. The All India Best Writers in each category will be given an honorary title of "Patron of Post". The prize winning letters will be published in important newspapers. The source of the fund will be intimated in due course. Wide publicity of the Campaign shall be given through newspapers advertisements and through other media channels including local level pamphlet distribution etc. The campaign will run from 24th June 2017 till 15-08-2017. Letter posted after 15-08-2017 will not be accepted. below/above the age of 18". In case of winning entries, the age and other ID certificates will be verified by the Circle before sending the best entries to Directorate. A Circle level committees" will be constituted to read and classify the letters according to the content. One of the members must be an academician or a renowned scholar of the particular language / literature / Gandhian studies / associated with journalism including a professor I teaching faculty in a college. Opinion of the scholars shall be given utmost importance while making qualitative selections. Selection Committee at the central level will be constituted in due course and intimated on similar lines. there is no specially designated letter boxes in my city post office . where should i post it now .. at which address ? ?